When Philip Kotler summarized the marketing work, the thing that stood out was the marketing mix. According to Kotler, marketing work is creating value – or something valuable – for the target market. The company creates value by building attractive products and services, providing the right price, putting it in a position that is easy to find, and promoting, so that the target market knows the existence of the product and wants it. From the answer it is clear, the marketing mix occupies an important position in marketing work. There are products, prices, locations and promotions there. Marketing Mix is ​​often criticized, but the criticism adds and refines existing concepts. So that a businessman is totally a concept of marketing mix, he cannot judge which aspects need to be considered to build sustainable sales. The following is the definition, elements and history of its development. Marketing Mix is ​​a series of marketing tactics designed by the company to generate market responses. The series in Jerome McCarthy’s version includes products, prices, locations and promotions. Marketing mix is ​​a variety of ways to meet consumer needs. McCarthy was not the first person to initiate the marketing mix, nor was the last person. But McCarthy’s concept is the simplest and most memorable concept. So Philip Kotler helped popularize it through the book Marketing Management which has become a reference for many marketing majors in campuses in various countries. Marketing mix is ​​an improvement on the concept of selling or selling. Sales by convincing people with words to buy existing products, are not adequate. Peter F Drucker in 1973 said, rather than surrender sales assignments solely to the sales team, it was better for the other side of the business to participate in supporting the success of the sales team. “People often assume business needs sales promotion activities. But the purpose of marketing is to make the sales promotion unimportant. The purpose of marketing is to know and understand the market well so that products and services are appropriate and sell by themselves, “said Drucker in the Management book. Marketing is a matter of how to understand what the market wants, and make an offer that matches that will, so that the product sells by itself. To be able to support the work of sales, products, prices, locations, need to adjust to the target market situation. Thus the promotion effort gets support from the marketing mix. The sellers will have trouble selling goods if the product, price and location are less supportive or not in accordance with market needs. Jerome McCarthy simplified the marketing mix with the 4P concept. Namely Product, Price, Place and Promotion. McCarthy’s formulation is easy to remember and this concept was later popularized by Philip Kotler, author of the book “marketing management” which has become a reference for many universities in various countries. The formulation of Jerome is formulated in 4 P namely product, price, place and promotion. • Product (product) – including characteristics, functions and benefits. • Place (location) – how the product is distributed to the target market. • Promotion (promotion) – delivering a message about the product to the target market. • Price – how much the product costs. Each component is a marketing activity to meet consumer needs. The details are as follows. Making a product is one of the marketing activities. Making products is not a promotional activity that invites people to buy. But designing products that are relevant to the needs of the target market and meeting their expectations, it will launch promotion. Products seduce not through words but through goods. In marketing, products are designed to reduce the workload of personal promotions and sales. For this reason, products are tailored to market needs. If there is no suitability, promotion will be desperate and requires a lot of energy and costs to get people to buy. Better energy is mobilized to improve and adjust products to market needs. Thus, designing the product is classified as an important marketing activity. It might also make a product not a marketing activity, when it doesn’t take into account the needs and demands of the target market. Making a product without thinking about its relationship with the target market will be prone to incompatibility between the product and their needs. Promotional activities will be difficult to seduce the target market to buy products. It’s certainly risky for business, sacrificing money, time and energy. Non-object products but solutions for consumers. Solution means a way out of suffering, the Company designs something valuable in the consumer’s perspective. Thus the transaction with the consumer is possible. The product is something that is offered, the benefits offered in the selected market segment. The product is offered to help the target market carry out tasks, reduce pain and increase happiness. Often companies assume they produce objects. Transactions can also occur. However, with this perspective, they do not know what to do when the object is not in demand and is no longer seen as a solution. What kind of improvements and services are needed to make them valuable solutions. Seeing products as a solution encourages companies to work for consumers to benefit. For that reason, packaging, operational guidelines, guarantees are present, because objects are not enough. In the perspective of a product-oriented company, products are the result of resource processing. Companies often identify themselves with the names of materials, shapes, and product categories, for example steel companies, furniture companies. The naming shows the version of the company, not the customer’s needs. In order for the product to be accepted by the wider market, companies need to understand the point of view of consumer needs. Consumers will buy products that offer the highest perception of value compared to other products. Perception of value is an assessment of the total benefits minus the total costs, compared to the valuation of other products. The benefits can be economic, functional and psychological benefits. The benefits of this application or translation of positioning. When we have formulated products that are relevant to their needs, are products always sold as expected. It still needs testing. Test the accuracy between your solution and their problems. Testing the accuracy between products and markets. To test the accuracy of the solutions and problems, can test one of the target markets. – Is the solution better than other alternative solutions. After successfully passing the accuracy, then a market test is conducted. The product is a series of visible and invisible attributes offered to satisfy consumers. Products work to make consumers get their needs. The product is sold, or offered to be exchanged for money. al through the website or telephone, so that consumers can deal directly with the company. The marketing mix component experiences development over time. In 1964, Neil H Borden wrote about The Concept of the Marketing Mix “in the Journal of Advertising Research, June 1964. About elements of the marketing mix for companies. a) Product lines offered: quality, design and so on. b) The intended market – to whom the goods are sold, where they are, and how much they are. c) New product policies – research and development programs. a) application of price levels. c) price policy, for example prices for units, prices for many purchases, prices for maintenance and so on. d) profit margins for companies and traders. b) Brand policy — product brand or company / product group brand. c) sales with private labels or without brands. a) Pathways between companies and consumers. b) selection of wholesalers and retailers. a) Amount of advertising spending. b) Fill in the ad. 1) Image of the desired product. 2) The desired image of the company. 3) advertising targets, merchants or consumers. a) Resource allocation for price cuts and promotional channels. b) promotional equipment for users and traders. a) Formulation of packaging and labeling. a) Resource allocation in the arrangement of goods that assist sales. b) A safe method of structuring goods. a) provision of services needed. 11. Handling physical matters, namely warehousing, stock and transportation. a) safeguarding, analyzing and utilizing facts in marketing operations. What are human needs? Why are the priorities of human needs different from each other? Abraham Maslow answered it with the Hierarchy of Human Needs Theory. There are five layers of human needs that are multilevel. It is often described in the form of a pyramid. Maslow grouped the needs into eight types. First, physiological and biological needs such as eating, drinking, reproduction, sleep, appropriate temperature, and rest. Both need security and security. This includes the needs that are protected from something dangerous. This also includes law, stability and order. Third the need to be loved and loved. This includes the need for friendship and close relationships. Including trust, acceptance, being a member of a family, friends and work group. Fourth, the need for success and prestige or good reputation. It can also be called the need for self-esteem, including (1) respect for dignity, achievement, expertise, and self-independence (2) the will to get respect and reputation from others. Fifth, self-actualization or the need to realize the full potential, talents, and aspirations. This is not just realizing the ability from within, but wants to realize his ideas about the outside world such as the idea of ​​society, the search for peak experiences. Later Maslow added a list of needs again. These needs can also be added to the needs of self-actualization. The added need is the need to know, aesthetically, and transcendently. Cognitive needs are the need to know and understand, seek meaning and predict. Aesthetic needs. That is the need to understand and feel the beauty of art. Transcendent needs are needs that are driven by greater values ​​than oneself, such as mystical experience, experience being part of nature, serving the people, seeking knowledge and religion. That is Abraham Maslow’s opinion about the hierarchy of needs. The hierarchy of needs does not only answer what human needs are but also answers, why humans at one time were very motivated to meet one particular need, not another. With the hierarchy of needs he explained that when humans are in a state of deprivation, he prioritizes basic needs. When basic needs are met, then he will prioritize the psychological needs of security and affection. Fulfillment of needs does not have to be 100 percent, but more or less fulfilled. Once a need is more or less fulfilled, the focus of attention will reach a higher level of need. Maslow classified the five needs into two. The four needs below are called basic needs (the term Maslow Deficiency Needs, D-needs). 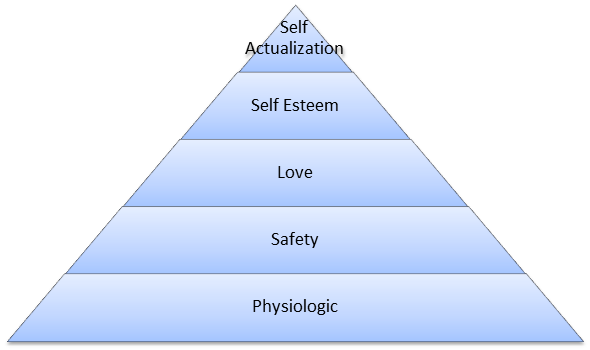 While self-actualization includes growth needs (growth needs, Being needs, B-needs). Basic needs, such as drinking water, which if fulfilled, then the motivation for drinking water needs decreases. People look for other needs that have not been fulfilled. If the water needs are not met, then people will be encouraged to achieve it. The longer the basic needs are not met, the stronger the motivation to get those basic needs. The longer a person is in a state without drinks, then he will have a strong urge to get drinking water. The need for growth, namely self-actualization, has a different character. When the need for growth is satisfied, motivation does not decrease but instead increases. Self-actualization is the desire to be self-full of its own abilities, to be anything according to its ability. Maslow found this motivation for self-actualization to emerge after the basic needs were sufficient. Basic needs start from physiology, security, love, self-esteem. If basic needs are not met, for example someone does not have a job, he will most likely prioritize those basic needs without regard to the needs of self-actualization. He will delay his taste for art, his dreams for society, the development of his talents. In addition, according to Maslow, the emergence of that need could rise and fall in the pyramid. That is, it can happen at a time, someone is more oriented to self-actualization, then because of changes in circumstances, re-prioritize to basic needs. The factors that influence this are the development of the external situation and the uniqueness of individuals. In 1987, Maslow improved the hierarchy of needs. The hierarchical sequences may differ from one person to another. Some prioritize self-esteem compared to love. Some prioritize love above self-esteem.